Yesterday, I posted a primer on the various degrees of hybridization, ranging from “micro hybrids”, to range-extended battery electrics. Here’s the follow-up, with coverage of the powertrain layouts of hybrids. A parallel hybrid is one that has both the ICE and the electric motor(s) connected to the wheels solely through mechanical paths. There’s quite a few ways to do a parallel hybrid - the primary methods are to place the motor on the ICE (in the case of Belt Alternator/Starter systems that GM uses), place it in between the ICE and conventional (manual, automatic, or CVT) transmission, place it after the transmission, or place it on a separate axle. All of these approaches have their pros and cons. A serial hybrid is one that has the ICE completely disconnected from the wheels, and all ICE power is sent through an electrical path, using a generator attached to the ICE (which also doubles as a starter motor). Most diesel locomotives use this layout (although they don’t tend to have electric energy storage, and therefore aren’t usually considered hybrids), as do some vehicles like the BMW i3 REx. There’s really only one kind of serial hybrid layout (the variations on the theme are only limited by how many electric motors are connected to the generator’s output, really), so I won’t expand on them in the specific configurations. The advantage of serial hybrids is that they offer full ICE speed flexibility as in a CVT, and are therefore sometimes marketed as eCVTs, but without needing to worry about a mechanical connection to the wheels, and therefore being free to package the ICE without worrying about a transmission. The downside is efficiency - you’re converting from mechanical energy, to (typically) three-phase AC, to a different frequency of three-phase AC, and back to mechanical energy, and you lose a lot to heat when doing this. A parallel-serial hybrid is a hybrid that uses a combination of both approaches - some ICE power goes through an electrical path, some goes through a mechanical path. There’s a couple main ways to do this - adding a clutch or torque converter to a serial hybrid is one way to do it (used by the Gen 1 Chevrolet Volt, the hybrid versions of the Gen 9 Honda Accord, the Mitsubishi Outlander PHEV, and the Koenigsegg Regera), and a power split device of some form (as used by almost all Toyota hybrids, all Ford hybrids, and some GM hybrids) is the other main way to do this. Just like serial hybrids, these systems offer at least one mode in which they can behave like a CVT, and therefore have been marketed as eCVTs by their manufacturers. In both cases, efficiency can be improved over a serial hybrid, at least in some modes of operation. However, engineering of these systems is harder (especially power split devices), and they must be packaged like a conventional transmission, as the engine is making a mechanical connection to the wheels. Through-the-wheels hybrids are a type of parallel hybrid that uses a conventional powertrain on one axle (typically front), with an electric motor/generator installed on the other (typically rear) axle. This requires zero modification to the ICE and transmission, and gives the benefit of all-wheel-drive. Downsides include the fact that handling can be weird if the hybrid system is heavily leaned upon, and the fact that the electric motor doesn’t get the benefit of multiple gears to optimize its power delivery. Peugeot/Citroën and Volvo have used this system on production cars, although with the addition of an ICE-mounted starter/generator that is capable of sending a small amount of ICE power to the rear axle or battery if the battery is low. In motorsport, the Porsche 919 Hybrid uses this layout, with an additional generator on the turbocharger for exhaust energy harvesting. In addition, many AWD variants of hybrids use a second (or, for some that offer torque vectoring, a third as well) electric motor on one axle, and are sometimes considered through-the-road hybrids. This allows the designer to avoid the weight and drivetrain loss of a mechanical AWD system (although with some electrical losses instead in some cases), and allows finer control over the vehicle’s handling than mechanical systems offer. However, unlike the systems described above, the through-the-road system is a secondary system, and most power is handled by another type of system (often either a pancake hybrid or some sort of parallel-serial arrangement), and as a result, I personally don’t like to use “through-the-road” to describe these systems. They’re used on compact crossovers such as the Toyota RAV4 Hybrid and Lexus NX 300h, all the way to hypercars like the Porsche 918 Hybrid. GM has made a couple of generations of hybrid vehicle using a motor/generator installed on the accessory belt, in place of the alternator, and also replacing the starter, marketed alternately as BAS or as eAssist. This is about as mild as a hybrid gets, but as it does provide assistance to the vehicle (especially at low RPM), it does count as a hybrid. Zero modifications are required to the transmission in this configuration, and it’s seen as a low-cost solution to hybridizing a vehicle. BAS systems are fairly low power, and therefore fairly low benefit, but because they’re matched to ICE speed, they’re well-suited to adding low-end torque to a relatively weak ICE (in many of the eAssist cars, it was used to make the 4-cylinder version drive acceptably well), and the electric motor also gets the benefits of the transmission’s torque multiplication. As an aside, the MGU-K in Formula 1 is closest in concept to a BAS layout, although they’re usually geared to the crankshaft, rather than using a belt, which greatly increases the power capability (effectively to that of a sandwich hybrid). In addition, the McLaren P1 uses a motor geared to the crankshaft (although on the flywheel side, not the accessory side). This is one of the two lightest hybrid system configurations possible (although it requires a light weight gearbox to be light, of course). These go by a lot of different names, but “sandwich hybrid” is a good one that I’ve seen, because it describes what it is, so I’m going with it. Essentially, a sandwich hybrid is a form of parallel system that places the electric motor in between the ICE and a conventional transmission. In addition, some sandwich hybrids place a clutch between the ICE and electric motor, so that the vehicle can be driven without the ICE running. Honda’s Integrated Motor Assist is an example of an early sandwich hybrid with no such clutch, and therefore acts as a mild hybrid. Conversely, most modern sandwich hybrids have that clutch. Most automakers selling a hybrid product today, if they’re not Toyota, Ford, Mazda (who’s buying transmissions for their one hybrid from Toyota), GM, or Chrysler, are using this system. Just like in BAS systems, the motor can be matched to ICE speed, and gets the benefits of the transmission’s gear ratios, but with the added benefits of a more direct connection to the transmission, and the ability in some variants to disconnect the ICE for greater efficiency. These systems are also popular in heavy duty vehicles, as they merely add to the ICE’s torque through existing heavy duty gearboxes, and unlike some more advanced systems, the hybrid system failing won’t take the vehicle completely out of service, and there’s lower cooling requirements than the more advanced systems. Also, if your gearbox is light weight, a sandwich hybrid is one of the two lightest configurations, and this has resulted in its use in the Toyota and Audi LMP1 hybrids for rear wheel hybrid deployment. (Porsche is only deploying hybrid energy to the front wheels, and Toyota and Audi also have front wheel deployment, however.) As far as supercar and hypercar applications, the Porsche 918 and Acura NSX are sandwich hybrids for their rear motors. There’s two main downsides, however, to a sandwich hybrid. First off, if the ICE needs to be started while moving, harshness will likely be higher than in some other systems, as it effectively has to drop the clutch on a moving car, to get the ICE started. A dedicated starter motor (which Honda’s IMA hybrids actually had for redundancy, in case of a hybrid system failure, even though they had to start the ICE to move in the first place) can work around this, but adds weight and cost. The second downside is that you have to have a conventional transmission, and that means that you’re either using a CVT, or you’re dealing with the sub-optimal RPM choices that a manual or a normal automatic/DCT offers. Post-transmission hybrids are parallel designs that occasionally appear in work vehicles, as a low-cost way of adding hybrid power to an existing vehicle design, without the OEM’s involvement typically. These are usually just put on the end of the gearbox of a front-engine or front-mid-engine RWD truck or van, with a shortened driveshaft. Because they’re post-transmission, they don’t get the benefits of the transmission’s gearing, much like through-the-road hybrids. This will make them heavier, and less efficient in part of their speed range. The LaFerrari, by the way, is using a post-transmission hybrid, for whatever reason, although laid out differently from the add-on system pictured above. These, personally, are my favorite, due to the sheer cleverness, capability, simplicity, and how they drive. Yes, how they drive. And, that’s why I own one. This is gonna be a bit long of a section, but bear with me. They’re also one of the two forms of parallel-serial hybrid. Essentially, with this system, you get the full ICE speed flexibility benefit of a serial hybrid, but with much better efficiency, due to the amount of power that can go to the wheels mechanically, rather than through the electrical path. Also, the motors can both be lighter than in a serial hybrid, as MG1 doesn’t need to take the ICE’s full output, and similarly, MG2 doesn’t need to take the combination of the ICE’s full output and the battery’s full output. The biggest downside of this layout is that the motors are going to be quite a bit bigger than a sandwich hybrid with similar power output, and MG2 doesn’t get the benefit of variable gearing. (MG1's a bit of a different story, due to the ICE affecting the speeds it sees.) Cooling is also required to be beefed up, due to how much power is going around through the electrical path, and this is why you don’t usually see power split hybrids in heavy duty applications. However, there’s a couple solutions to these weaknesses, one approach used by Toyota, the other by GM. Toyota’s approach is rather simple, really - put a 2-speed gear reduction box after the power split device, for use in the GS 450h and LS 600h. This meant that the transmission could shift to select between efficiency and performance, as needed to satisfy the driver’s wishes. Toyota has expanded upon this, with the Lexus Multi-Stage Hybrid system planned for the LC 500h, which will use a 4-speed gear reduction box instead of the old 2-speed. GM’s approach, in their 2-mode systems, is a lot more mind bending... but essentially involves a second stage of planetary gearing, that can be optionally engaged to configure the power split in different ways, to optimize the efficiency range. Depending on implementation, this also creates either 1 (Allison hybrid bus transmissions, Gen 2 Voltec gearbox (Gen 2 Volt, hybrid version of the Gen 9 Malibu) or 4 (Global Hybrid Cooperation gearbox, used in 2008-2013 full-size pickups and SUVs, some Chrysler, BMW, and Mercedes-Benz hybrid SUVs at the time) fixed gears in addition to the two power split modes. These systems seem to be somewhat better suited to heavy duty applications (I mean, they’re used in city buses), but increase the complexity by quite a bit, and the Global Hybrid Cooperation system was a complete flop. So, there’s no consistent name for systems like this, so I’m going with, well, what I went with. The systems that I’m aware of that have used a clutch alongside a serial hybrid have been marketed as GM Voltec (Gen 1, anyway - Gen 2 is a 2-mode power split system), the Mitsubishi Outlander PHEV’s system, Honda’s i-MMD, and Koenigsegg Direct Drive. With the exception of Koenigsegg Direct Drive, these systems all behave as serial hybrids below roughly 35-45 MPH, and then if power demand versus road speed warrants, can engage a clutch, to engage a single gear. Koenigsegg Direct Drive uses a torque converter instead, increasing flexibility. These systems require less engineering than a power split hybrid, and potentially offer better efficiency at higher speeds if your load and your speed are well matched. However, if they’re not well matched, the hybrid system ends up working overtime to barely beat a pure serial hybrid on efficiency. (Essentially, if the ICE is revving too slowly, the hybrid system needs to spend battery power, until the battery is flat, then the clutch needs to be disengaged to recharge the battery. Conversely, if the ICE is running too quickly, the hybrid system needs to generate power off of the excess power from the ICE, until the battery is full, then the ICE needs to shut down to burn off that energy - this is something that can happen in a power split hybrid, too, but it only happens at low speeds, where any ICE vehicle would be inefficient if it didn’t do that.) And, weight is higher than in a power split hybrid, too - motors need to be heavier, after all. In my opinion, while these systems can be effective, as the Accord Hybrid is showing, they’re the lazy way out. 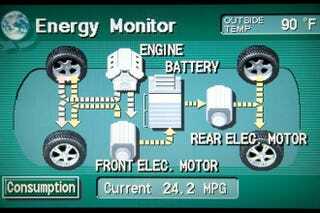 As far as I’m aware, these are the common types of hybrid system used in cars. Tomorrow, I’ll cover the various energy storage methods used by hybrids, including non-electrical systems.